First you need to paint your nails with which ever color you like. In my original nails I chose a black base, but I like white much better. Then, using a tiny dotting tool (or a needle, possibly a toothpick, I used a #18/0 spotter brush) make a bunch of dots near the tip of your nail, so many that barely any of the base color shows through. You can use nail polish for this, but I chose to use acrylic paint. After that keep working in sections, using less and less dots and making the sections ever so slightly bigger until you reach your cuticle. If you have long nails you could probably stop before the cuticle, or you could just make the sections bigger. 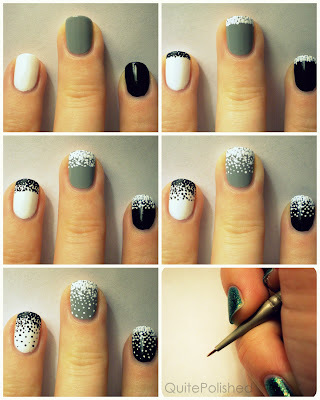 I like to do four sections, but you could do more or less depending on how gradual you want the gradient. If there’s any confusion please let me know and I’ll try to clarify! You should! It's so easy and doesn't take much time at all! I nominated you for a blogger award. Where do you get the dotting tool?? I actually used a tiny paintbrush :) I bought it at Jo-Ann fabrics for about $3, I just picked the smallest brush they had. Awesome! This works really well with nail art pens too!